Newton-John attending the premiere of A Few Best Men in Sydney, Australie, 2012. 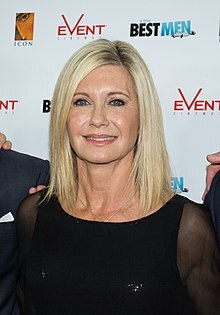 Olivia Newton-John, AO, OBE (born 26 September 1948) is a Breetish-born Australie sangster, sangwriter, an actress. She is a fower-time Grammy award winner who haes amassed five No. 1 an ten ither Top Ten Billboard Hot 100 singles an twa No. 1 Billboard 200 solo albums. Eleiven o her singles (including two platinum) and 14 of her albums (includin twa platinum an fower double platinum) hae been certifeed gowd bi the RIAA. Her muisic haes been successful in multiple genres includin pop, kintra, an adult contemporary an haes sauld a estimatit 100 million records warldwide. She co-starred wi John Travolta in the film adaptation o the Broadway muisical Grease, which featured ane o the maist successful soondtracks in Hollywood history. Newton-John haes been a lang-time activist for environmental an animal richts issues. Syne survivin breast cancer in 1992, she haes been a advocate for halth awareness becomin involvit wi various charities, halth products an fundraisin efforts. Her business interests hae includit launchin several product lines for Koala Blue an co-awnin the Gaia Retreat & Spa in Australie. Newton-John haes been marriet twice. She currently lives wi her seicont husband, John Easterling, in Jupiter Inlet Colony, Florida. She is the mither o ane dochter, Chloe Rose Lattanzi, wi her first husband, actor Matt Lattanzi. a: Released with a different track listing in the North America. Also released in certain territories as Music Makes My Day. b: North American release of Long Live Love. Also features tracks from previous releases and the new title track. Glee Hersel Special guest – 2 episodes: "Bad Reputation" and "Journey"
↑ Erlewine, Michael (1997). All Music Guide to Country. San Francisco: Miller Freeman Books. p. 334. ISBN 978-0-87930-475-1. Retrieved 13 August 2010. ↑ Pearce, Garth (5 December 2011). "Olivia Newton-John: Why I got married in secret at 60". Daily Express. Retrieved 18 February 2013. ↑ 1001 Australians You Should Know. Google Books. Retrieved 13 August 2010. Wikimedia Commons haes media relatit tae Olivia Newton-John. 1995: "Gangsta's Paradise" – Coolio featurin L.V.